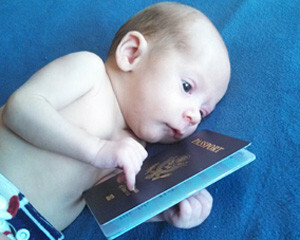 “Does my newborn baby need a passport?” is a question that we hear often here at PassportInfo.com. The answer is YES! Babies, even newborns, are subject to the same passport requirements as adults. If you plan to take your baby outside the US, you will need to go through the minor passport procedure to get your baby a passport. There are a few added elements of difficulty in getting a passport for a newborn, all of which we will help you solve with our two part guide to newborn passports. In today’s installment, we’ll go over the most important document you’ll need to apply for your baby’s first passport – the birth certificate. The key to getting a passport is to be able to prove US citizenship, and for babies born in the US, that is done by providing an original birth certificate. The birth certificate needs to be a “long form” that displays the parents’ names. Short-form certificates showing only the child’s information and card-style birth certificates are not accepted. 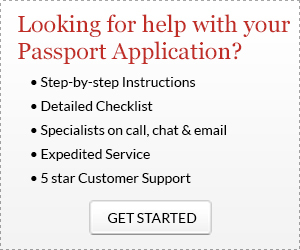 Your very first step in getting your baby’s passport will be to get your baby’s birth certificate. The way you do this will vary, based on where you give birth. Hospital Birth: The staff at the hospital will give you a form to fill out with the information that will be listed on the birth certificate, including the baby’s name and details about the mother and father. They will then file this form with the local Bureau of Vital Statistics or Health Department for you. In some jurisdictions, the completed birth certificate will automatically be mailed to you, and in others, you may need to visit a government office in order to pick up the birth certificate. If you go in person, you must bring photo ID to show that you are the baby’s mother or father. Pro tip: request a second copy of the birth certificate! It is usually only a few dollars more to have a second original copy printed. Freestanding Birth Center or Homebirth with Certified Midwife: If you give birth outside of a hospital with a certified, registered midwife, your midwife will help you fill out and file the form for your baby’s birth certificate. The process is otherwise just the same as if you gave birth at a hospital. Unassisted Homebirth: It is a little bit more complicated to get a birth certificate if you give birth without a doctor or certified midwife in attendance. The requirements vary from state to state, so check with your local Health Department to find out exactly what you will need to do. If you are planning to give birth without assistance, it is a good idea to confirm the requirements for a birth certificate before the baby is born. In many states, you will need to provide “proof of pregnancy,” such as medical records or notarized statements from friends or relatives attesting to your recent pregnancy. If you have your baby in a foreign country, you will need to take your baby to a US Embassy or Consulate in order to have a Consular Record of Birth Abroad (CRBA) issued. Typically, you will also apply for your baby’s passport and Social Security Number at the same time. You will need to have your child’s birth certificate issued by the local authorities before you can apply for the Consular Record of Birth Abroad. Once issued, the CRBA will be your baby’s primary proof of US citizenship, and will be submitted when you apply for your child’s next passport… which won’t be that far off in the future, as minor passports are only valid for five years! Stay tuned for part two of this series, when we’ll discuss other essential documents needed for your newborn’s passport. Previous PostMexico Requiring Passports at San Ysidro Border CrossingNext PostIs Your Passport Too Damaged To Fly?